The Christmas tree is up and I'm feeling relatively festive. I love Christmas, always have done. I can't say that the shine hasn't been taken off things this year but I can still feel the magic. 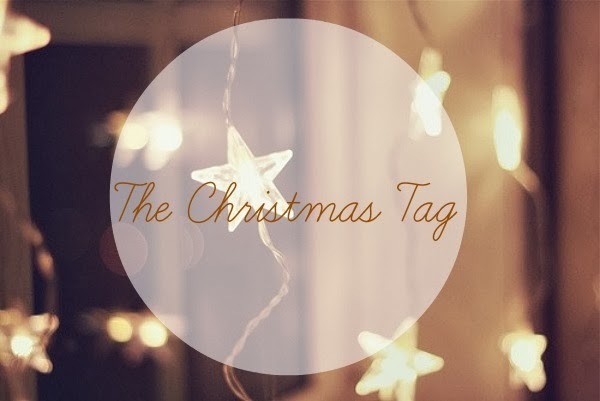 In order to try and get into the mood a little more I thought I'd give Ella's tag a go. I don't have a set schedule, usually I'll pick things up from about July onwards if I see something that I think will make a good Christmas present. This year I started in the summer again, granted the only shopping I did was for my ex (I left everything in his office at our home with a note explaining what it was when I moved out - I couldn't stand to return everything). As I've started from scratch I've only started shopping in the last week, I've finished shopping for my mum but I've not done a scratch for anyone else! I really need to pull my socks up. Absolutely not! Christmas food can be eaten all year round in my book, it's never too warm or spring like to enjoy festive treats. Perhaps when I'm in my own place I'll gradually develop my own traditions at Christmas but for now give me Christmas food 365 days of the year. When I was small I was usually the first person in the house to wake, I'd sneak a look at my bedroom door and if my stocking was full then I'd jump out of bed and bound in to see my brother. Once he was awake (he was always less enthusiastic than me) we'd either go straight downstairs, making sure to make enough noise to wake my parents, or go in and see them. After that all the Christmas presents under the tree would be opened, a small quantity of chocolate would be consumed and eventually we'd move onto Christmas lunch at about 2pm. As my brother and I got older we started getting up later (no more 4am starts) and early morning chocolate would be accompanied by champagne. I'm not sure how it's going to work this year. My brother isn't here as he bought his own house earlier this year, it's just me and my parents. I suppose I'll have a bit of a lay in, celebrate if I manage to wake up without wanting to cry in the first five minutes and then head downstairs. Perhaps this year I'll wait until my brother arrives to open my presents, I think it might be a little sad to open my stocking and presents on my own. The rest of the day will probably be business as usual, chocolate, champagne, turkey and BBC repeats. Ignoring the fact that things were quite a bit different last Christmas, this year I'm reverting back to my family traditions. I help my parents pick out a tree, put the Christmas decorations up and on Christmas morning I always wrap the pigs in their blankets. In years gone by my dad, grampy and I would take a walk around the neighbourhood after lunch, now that my grampy isn't with us we've not done it for the last few years so I'm hoping that this tradition will return with just me and my dad. I don't like to drink coffee at all, I can't stand it. Love the smell, not the taste. However, it's at this time of year that the chai tea latte comes into it's own. It's Christmas in a mug, perfect for the festive season. It's a tie between Wizzard's "I wish it could be Christmas everyday" or "Merry xmas everybody" by Slade. I'm a fan of cheesy Christmas songs. I mainly sit around, eat snacky food and watch excessive amounts of TV. We don't have any Christmas eve traditions in this house. In the past I've gone to Christmas eve mass with my mum, but it's so incredibly boring that I'm not willing to go out in the cold for it anymore. Do people have wrapping strategies? I don't have one. I buy paper and bows etc in the sale after Christmas for use the following year. I don't wrap as I go, I have one night where I'll stick on a Christmas film and wrap everything. Typically I'd bring all the presents down on Christmas morning but for the last two or three years I've put them under the tree before Christmas day, mainly because that's what my ex did. I'm planning on sticking to his method as I like how it looks. Not going to happen - I'd like the man I married back. The happy, in love with me man. Failing that, an end to feeling down at the silliest of things would be swell. More likely to happen - my Amazon wish list is bursting with lots of beauty goodies, mainly from John Lewis such as Estee Lauder's New Advanced Night Repair II. Anything from my list would be greatly received. It's a beauty of a tree! It's real and just under 6 foot. We stick to traditional colours in our house, gold and reds. We also have clear and white fairy lights on it, plus a few chocolates (which we're not allowed to eat 'til Christmas day). The banisters are adorned with Christmas cards, the hand rail has lights woven around it. The mantelpiece is decorated with a garland, lights, candles, ornaments. The kitchen windowsill also gets decorated too. Lights go up outside the front of the house too. Oh! The sideboard in the dining room is decorated with Christmas ornaments too. 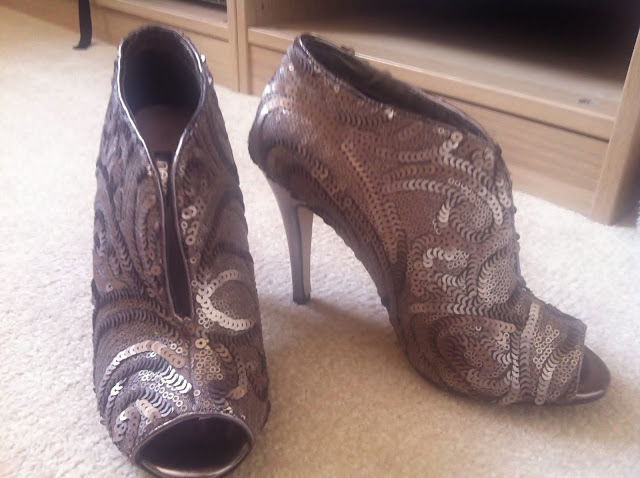 On Christmas day I usually go for a smart/casual look, sometimes a dress or sparkly top with jeans. This year I'll be slumming it in PJs or comfy clothes for most of the day. If I had a pair of tracksuit bottoms I'd probably wear those. Total comfort is the look/feel I'm going for.